Gerald Long speaks about Rose: Sen. Gerald Long remembered his late wife Rose during an event to celebrate her life with friends and supporters at Northwestern State University. Sen. Long announced the creation of the Rose Landry Long Scholarship for first generation college students and introduced the inaugural recipients during a program that reflected the late Mrs. Long’s influence and legacy. 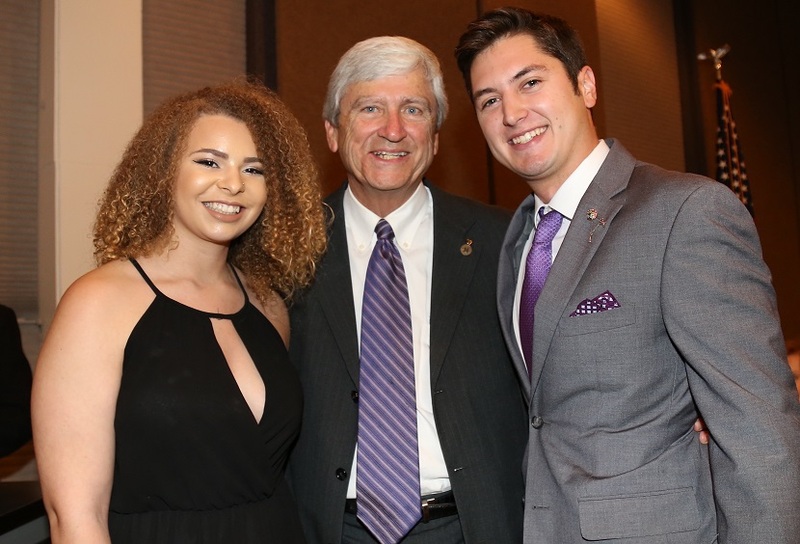 Press Release – NATCHITOCHES – Sen. Gerald Long hosted an event Wednesday to celebrate the life of his late wife, Rose Landry Long, and announce the recipients of two scholarships named in her memory. 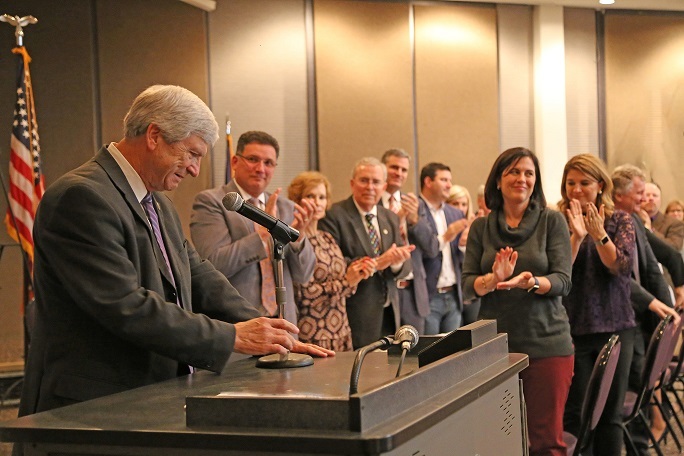 Friends, supporters and officials from all regions of the state filled the Friedman Student Union Ballroom at Northwestern State University for the celebration in which Long announced that 0,000 had been raised to fund the scholarships with another pledge of 0,000 to be announced Dec. 6. Inaugural recipients of the Rose Landry Long Scholarships are Elizabeth Schoubroek, a business administration major from Zwolle, and Rowdy Burleson, a criminal justice major from Evelyn. Recipients must maintain a 2.5 grade point average and must be full-time first generation students. Rose Long Scholarship Recipients: Elizabeth Schoubroek, a business administration major from Zwolle, left, and Rowdy Burleson, a criminal justice major from Evelyn, right, are the inaugural recipients of the Rose Landry Long Scholarships for first generation college students, created by Sen. Gerald Long, center, to honor his late wife. The recipients were announced during a benefit for the scholarship and celebration of the life of Mrs. Long at NSU Wednesday. Mrs. Long grew up in rural Vermilion Parish seven miles from Gueydan in the farming community of Klondike. Her parents Andy and Leontine Landry were hard working rice farmers who farmed land owned by her grandfather. Mrs. Long was the fourth of five children. She always had a desire to learn, which would become evident in her school work and pursuit of excellence. 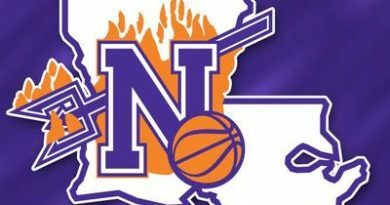 After graduating from Gueydan High School in 1965, she entered NSU on the recommendation of her high school French teacher who graduated from what was then Louisiana State Normal College, and that would later become Northwestern State University. She was the first member of her family to enter college and she graduated with honors in three years. While a freshman at NSU, Rose met and fell in love with Gerald Long. They married 11 months later. The Longs were parents to two daughters and a son with nine grandsons and one granddaughter. Sen. Long said he was humbled by the outpouring of support for his endeavor to honor his wife. “She always had a passion for people and many times you would find that passion manifested in faith,” he said. Mrs. Long touched many lives through her civic involvement, through leading Bible studies and engagement with child and family resource centers throughout Louisiana. The Longs mentored many middle school, high school and college students and coaches through Fellowship of Christian Athletes. Mrs. Long served as her husband’s campaign manager when he ran for the State Senate and after his election was involved with the Legislative community, leading Bible studies, hosting prayer breakfasts and serving on committees that addressed moral and social concerns. She also chaired the Louisiana Legends committee for Louisiana Public Broadcasting, and was recognized as the Public Broadcasting System’s Grassroots Advocacy National Volunteer of the Year. During her illness, she could often be found seeking out and praying with strangers in cancer treatment waiting rooms. This past June, La. Gov. John Bel Edwards and First Lady Donna Edwards renamed the rose garden at the governor’s mansion in memory of Mrs. Long. “Here in Louisiana, we have the best people and Rose was at the top of that list,” said Lt. Gov. Billy Nungesser. Wednesday’s event featured hors d’oeuvres and Louisiana fare provided by Chef John Folse and staff with assistance from NSU’s culinary arts students and faculty. Sen. Long hosted a similar event Sept. 12 in Baton Rouge in which Folse provided the meal at no cost. “Long after all of us are gone, there will be some freshman from Zwolle or Shreveport who won’t know who Rose Long was, but will know the result of her life and of her faithfulness,” Long said. 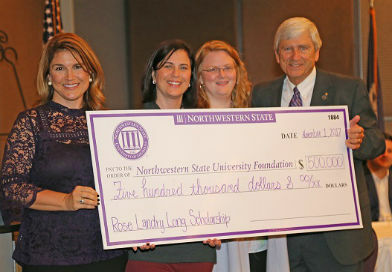 For information on supporting the Rose Landry Long Scholarship, contact NSU Development Officer Rebekah Burleson at (318) 357-5213 or burlesonr@nsula.edu. Rose Long Family: Sen. Gerald Long, right, with daughters Pam Jordan of Shreveport and Andrea Phillips of Ruston and daughter-in-law Sheralyn Long of Baton Rouge announced recipients of a scholarship created in memory of Sen. Long’s late wife, Rose Landry Long, funded through a donation to the Northwestern State University Foundation. The scholarship will annually benefit two first-generation college students.